Thanks to my daughter-in-law for introducing this Crunchy Coleslaw which now shows up at almost every holiday celebration. Well-suited for any time of the year, but particularly welcome in the spring or summer. Are you a coleslaw fan? The whole subject can be polarizing. Some like it tart contrary to those who like it sweet. Some prefer it with onions, others not. Still, others want mayonnaise in the dressing while some resist the white stuff. 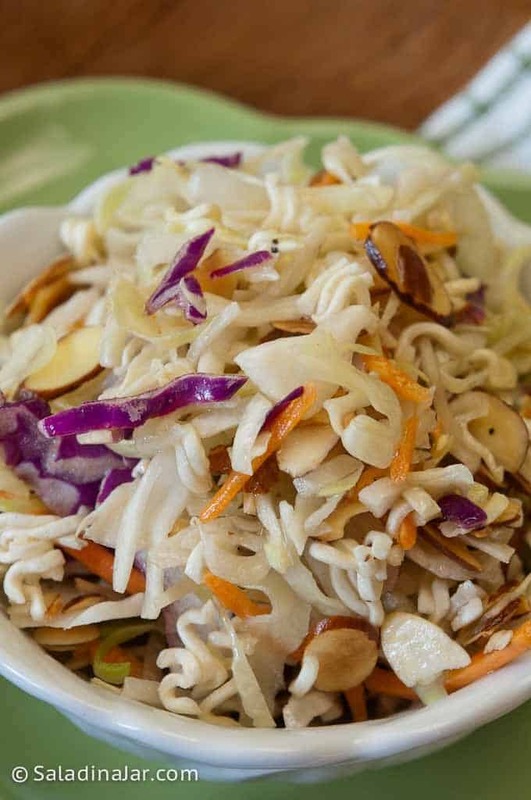 If you’re like me and often ask, “What can I substitute for coleslaw?” when you go out to eat, you should try my daughter-in-law’s Crunchy Coleslaw. It isn’t the traditional recipe, which may be why I love it. So does the rest of our family. My daughter-in-law, Susie, claims the recipe comes from her family cookbook. According to her, the notes say it is from “Mom Alexander.” She is Susie’s Aunt Julie’s mother-in-law and passed away a couple of years ago. It looks like her memory will live on every time this recipe shows up at a family gathering. Moral of the story? Share your best recipes if you want to be remembered fondly for years to come. At least that’s my philosophy. 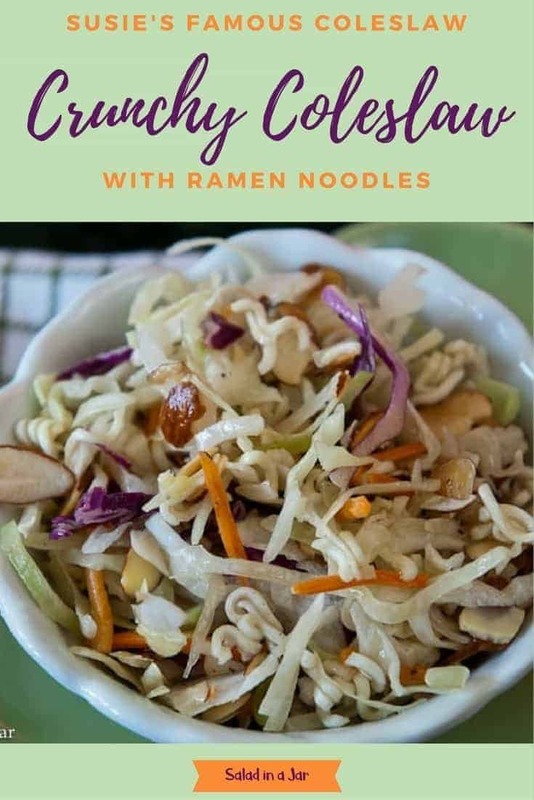 So, here’s the Cliff notes on this version of coleslaw: slightly sweet-and-sour dressing, no onions, no mayonnaise, sliced cabbage, and LOTS OF CRUNCH from the Ramen noodles and almonds! Warning: This coleslaw doesn’t keep well. Fortunately, that’s not a big deal because I doubt you’ll have many leftovers. It’s best when mixed shortly before serving and eaten before the noodles absorb moisture from the dressing and lose their crunch. Mix sugar, oil, vinegar, and pepper together to make dressing. Use a small container you can shake to mix to make it easier to transport later. Toast sesame seeds and almonds. (I do this in my microwave for 1-1/2 minutes on a paper plate. Stir once.) When cooled, put into a zippered plastic bag if not eating immediately. Put whole brick of Ramen noodles with seasoning packet into a quart-size zippered plastic bag. Use a rolling pin to crush. Store in bag until ready to assemble salad. Place coleslaw into salad bowl. Cover with plastic wrap. Bring salad dressing container, nuts, and crushed Ramen noodles with you to wherever salad will be eaten. 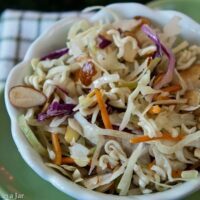 Just before it's time to eat, add nuts, Ramen noodles, and dressing to the bowl of coleslaw. This recipe is best fresh and crunchy. The sugar is NOT listed in the instruction portion of recipe. I had to look at other recipes to figure out how to mix it in. I’m so sorry, Dona. You were right. I corrected the instructions. Thank-you so much for taking the time to write me about it. Hope it turned out deliciously for you. I’ll take this variety of coleslaw. I’ve tried to like the traditional stuff for the last 18 years since we moved to the South but I think I really have to be in the mood for it because sometimes it good while others I can’t swallow :). I have tried this type and I do like the crunch factor from the nuts, slaw and noodles! 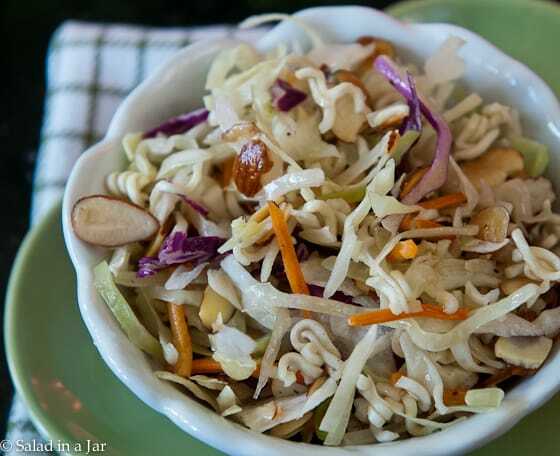 Crunchy Coleslaw is really perfect for holiday. This sort of recipe has a lot of nutrients since it is made up of a lot of vegetables. Love to try this one. I am crazy for coleslaw… but only the kind without mayo! I like the tangy freshness and the crunch. My sister makes one like this with chopped cooked chicken so that it makes a nice main dish salad. Aren’t you so happy that Summer is almost here? Our household needs the nutrition goodies cabbage brings, so I was eager to try this one! I left out the sesame seeds and nuts (hubby doesn’t eat them) and added apple and radish instead. It was a big hit (even with my one year-old) and it will become a mealtime staple. Love your substitutions. Don’t you love it when you find something your kids like to eat? Thanks for coming back to tell me about it. I have a similar recipe from my late mother-in-law. It has soy sauce in addition to the oil and vinegar. I mix the sugar with the soy sauce, oil and vinegar and briefly nuke it so that the sugar dissolves. I also add about 1 tsp. of sesame oil to amp up the Asian flavors. If you store the noodle/nut/seed mixture and the dressing separately in the refrigerator, you can just toss this together when the mood strikes. It keeps forever. I have also seen variations where chicken and mandarin oranges are added to make it a main dish. I do enjoy a bit of slaw every now and again. Love the look of yours, especially with the almonds and noodles mixed in. Love anything with Ramen noodles! These ingredients are “clean” and not overburdened with a heavy dressing. I’ve had something similar and can almost eat myself silly on this stuff! I love your idea of taking all the ingredients separately and then putting together at the last minute! Funny… I just had this exact salad for lunch today! 🙂 When I’m having it for a meal, I add half lettuce and half cabbage and then today, tuna. Equally delicious with chicken or really any protein of your choice. A yummy classic in our house! Thanks for spreading the joy! I’m hungry for it right now! OK – I instantly love this although I’ve never eaten it. And yes, cole slaw for me is always rather uninspired, but it seems like something I feel obligated to serve, especially when I’m doing my pulled pork.